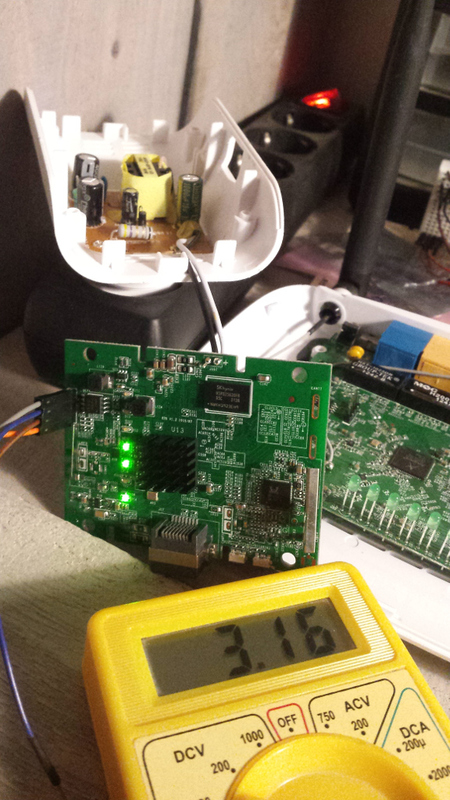 In the previous post on this series I used my reference router and a SBC (a Raspberry Pi 3 in that case) to connected to the router console. That worked very well, so I tried with new devices... but it didn't worked that well with those. Anyway I will tell you in this post what I have done, and maybe... some good people out there could help me with this. Let's start with the EM4551. Now it is easy to remove the main board out of the box to work on it. We can see a 4 pin connector in the top part of the board (close to the activity LEDs). That is very promising. 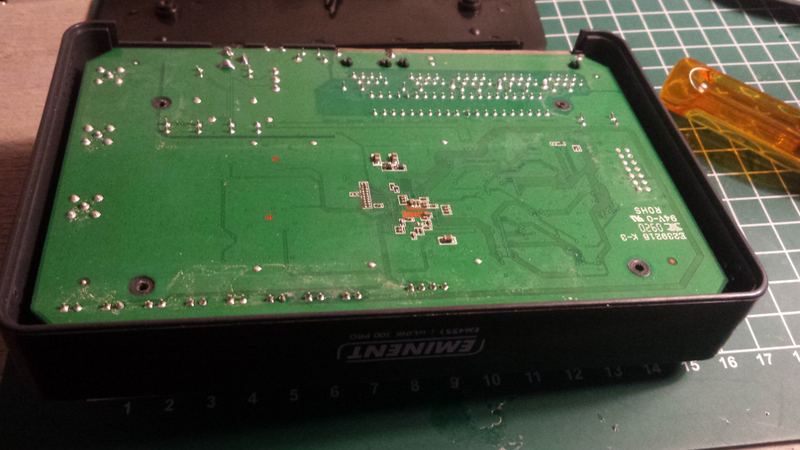 There is also an unpopulated header on the left side of the board. This is a 14 pin connector so we have some chances to get a JTAG interface there. 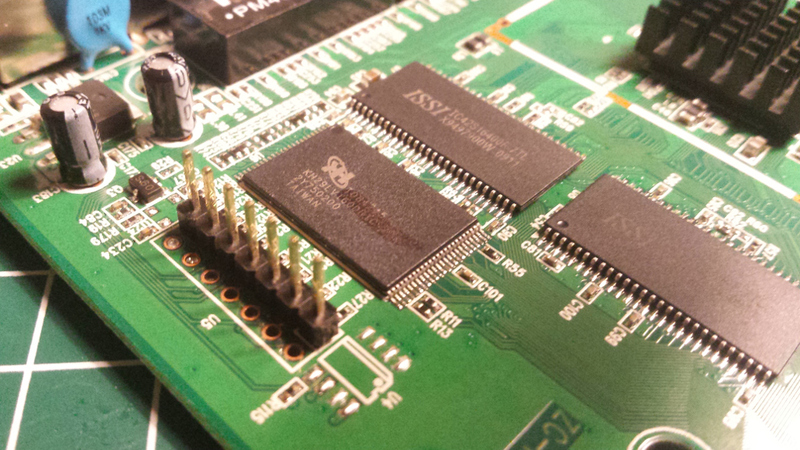 The next step will be to try JTAG access. The have populated half of the 14 pins connector in the board. 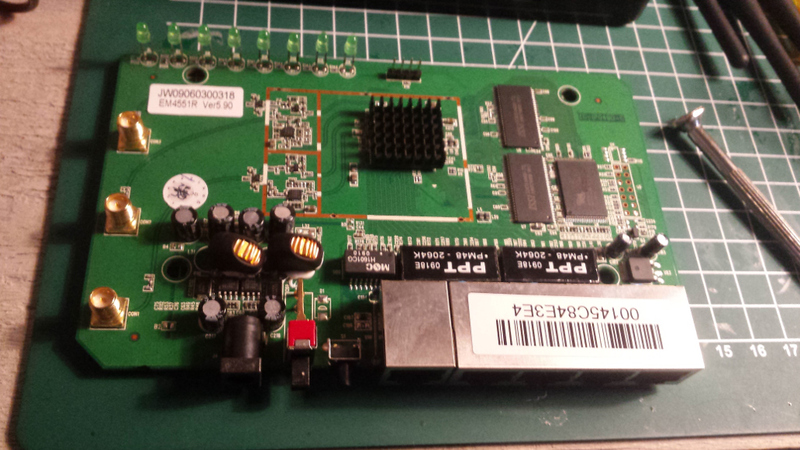 According to some information I found around, all the required JTAG signal should be there. If not, I will have to solder the other half. Soldering itself is straightforward. The problem is that the holes in the board are filled with solder and it is not that easy to remove. I removed the solder for the pins I added using the iron, but, for the next one,... I will try to use a drill. 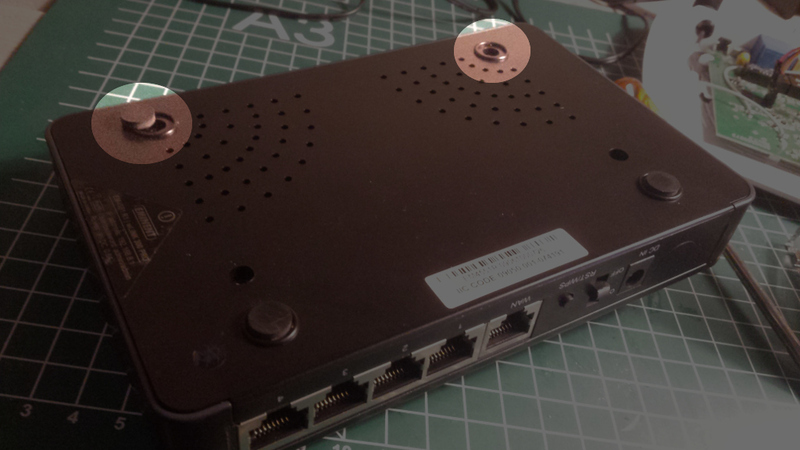 This little guy is a wifi repeater. I found it in a local shop. A quick search shows that it provides a web interface and the fact that it cost around 20 bucks means that it can have a computer inside. I took my chances and I bought one. It can easily be open just removing 4 screws. We can see 4 holes on the board that may be our serial port. Let's keep checking the hardware before exploring that connector. 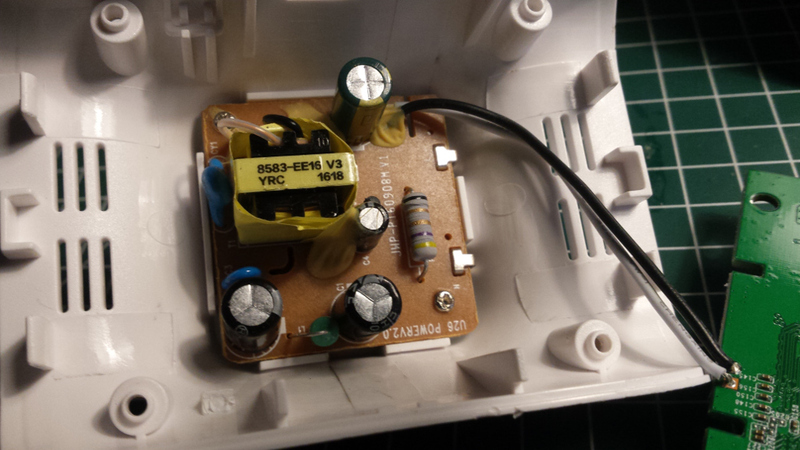 The power supply is below the main board and it is connected to it using 2 wires. So I added some pins to that 4 pins connector and started checking if that was a serial port. 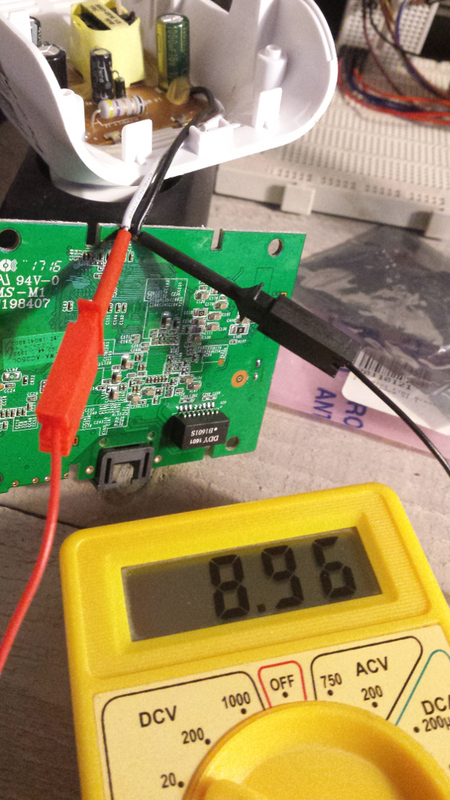 The first thing I did was to check the voltage of the power supply. In this case if was something around 9 volts, but it didn't looked very stable. There is probably some filtering circuitry in the board to deal with that. Then I checked the 4 pin connector voltage. 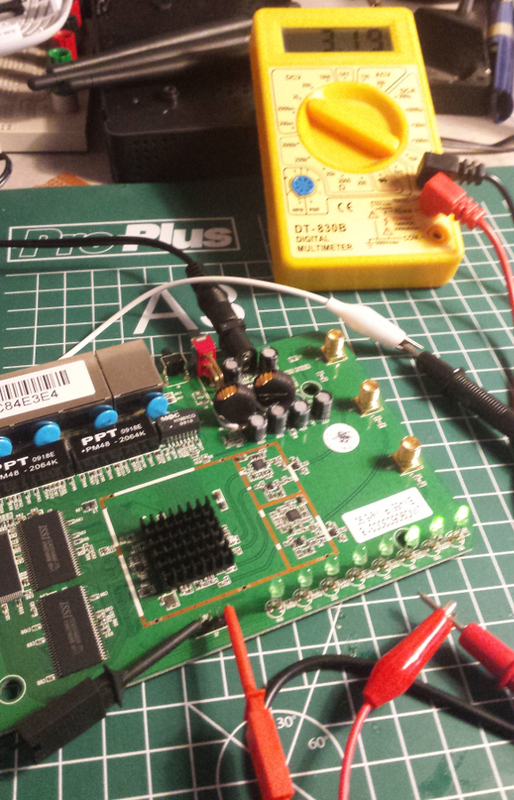 It looks like another 3.3V TTL serial. Again, following the typical continuity test, I identified the different serial pins and determined that this one transmits at 38400 apparently with the standard 8N1 as usual. 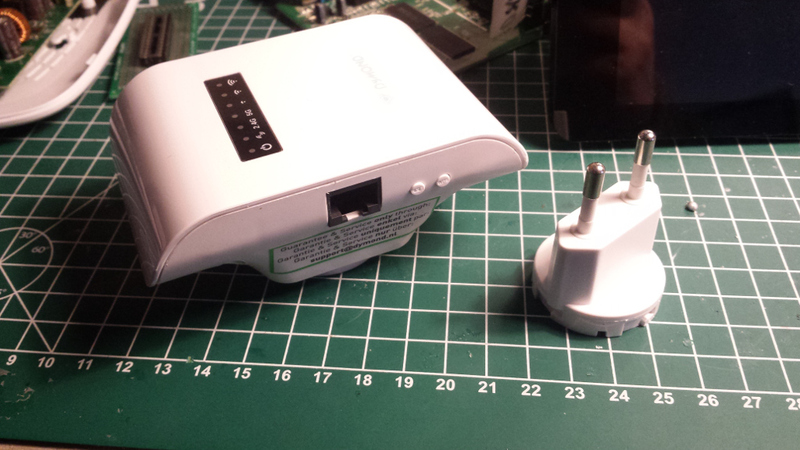 This one boots normally and ask for a login, however my transmission line towards the router is wrong. The echo I receive from it does not match what I send. I tried with different configurations but nothing worked, and I finally gave up with this one... at least for the time being. There is some HW element missing in the board that prevents the Rx line to work properly. Checking different resources in the internet I found that for some routers you need to add some pull-up or serial resistor to the Rx line and sometimes, you may even need to shotcut some connection in the board or remove some resistor. So, I have stopped here with this device. 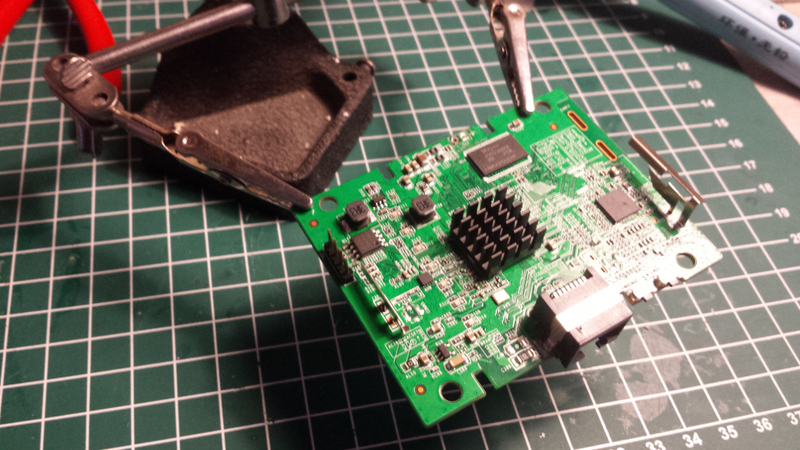 I don't feel like spending another 20 bucks to figure out if I had managed when I connected the Vcc pin and I still need to sharp my skills to be able to determine if I have to do some modification on the board. no sys signature at 00017000! no rootfs signature at 00137000! !!! adjust 5G 2ndoffset for 8812 !!! 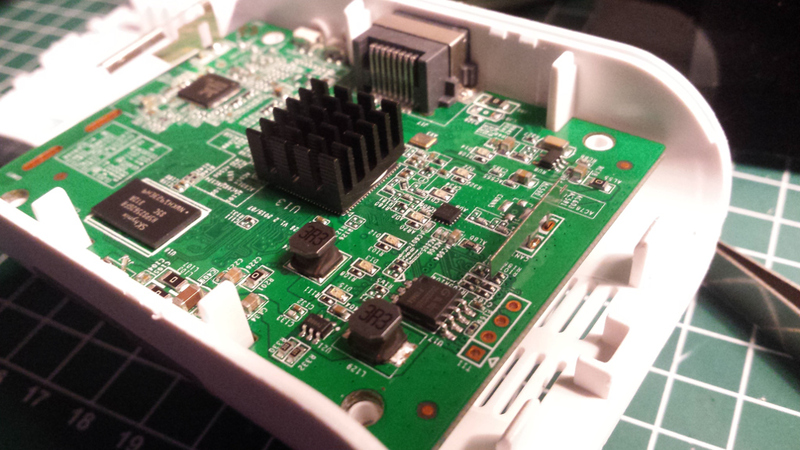 WiFi Simple Config v2.18-wps2.0 (2015.11.09-07:03+0000). boa: server built Jun 21 2016 at 16:51:11. In case you, beloved reader, are an HW expert, here is a small video of the behaviour of the router. This may be familiar for you and maybe, somebody can say... Oh man, you have to do X to make this work. In the meantime thanks for reading this.